Art League Houston (ALH) invites you to indulge your inner fashionista at ALH's first Giveback Shopping Social event of the season. Join us at Muse Boutique in River Oaks to shop till you drop between 10 AM - 7 PM on Thursday, July 24 and 20% of all full price purchases will benefit ALH. Can't come till after work? Join us for a special Sip N’ Shop Social between 5 - 7 PM featuring light bites and bubbly hosted by ALH's Board Member Frida Dillenbeck. Don't miss this unforgettable shopping experience to shop exclusive designer lines, play with Hollywood make-up, adorn yourself with fun jewelry and peruse the latest home accessories to make your home as chic as you are, all while supporting a local arts organization who has a history of brightening Houston's public spaces! Can’t make it? Shop online at www.musehouston.com and call the shop to let them know your purchase is in support of Art League Houston. Art League Houston (ALH) is excited to presentAujourd'hui, Causons Avec Nos Aieux: Intimate and Foreign, an exhibition of work by Cameroon-born and Houston-based artist Rosine Kouamen. The exhibition features a selection of photographs, video, textile and sculpture that explore themes of ancestral history and genetic nostalgia, in relation to cultural traditions, spirituality, morality, ethnicity, geography, beauty, and ethics. The opening reception is Friday June 20, 6 - 9 PM with an artist talk at 7:00 PM. Aujourd'hui, Causons Avec Nos Aieux: Intimate and Foreign explores ones understanding of tradition vis-à-vis modernity, as it continues to affect global communities. The works in this exhibition focus on how cultural relativity influences worldview, and encourages a dialogue between foreign and domestic conceptions. The exhibition is centered around a site-specific textile sculpture, which hangs from the ceiling in the middle of the gallery. The artwork references traditional African hierarchical and societal structures, and explores how constructed imaginations of relatives lost, are the result of relentless rewriting of others’ histories. The exhibit also features a series of mixed media sculptures that line the gallery walls, referencing the development of filial history, as it intertwines with particular regional histories. Art League Houston (ALH) is excited to presentJump Cut, an exhibition of new work by Houston-based artist Peter Lucas. The exhibit features a series of collages, altered media objects, and video works that playfully explores the nature of montage through simple, bold slicing and splicing of imagery.The opening reception is Friday June 20, 6 - 9 PM with an artist talk at 6:30 PM. With a sensibility informed as much by film and music as by traditional visual arts, Lucas’ work is largely concerned with creating tensions and transitions between elements. This exhibition includes new collages, media objects, and a multiple-screen video installation made with imagery from various printed media (books, magazines, packaging, etc.). Jump Cut playfully and aggressively reframes and combines elements of photographs, illustrations, typography, and sound. The show’s title references a particular kind of discontinuous splice found in film editing, and more generally calls attention to the assertive act of cutting and the resulting “sparks” in the hard transitions of the work. Art League Houston is excited to present Sexual Selection, a site specific outdoor installation in the ALH Sculpture Garden by New York-born and Houston-based installation artist Jo Ann Fleischhauer. The project is inspired by the evolutionary process of the Birds-of-Paradise known as sexual selection, where females choose their mate based on the shape, color and display of the males’ plumage, and have ultimately determined the species' diverse and exotic variations. The installation explores ideas of visual aesthetics, in particular the function of beauty and features over one hundred brightly colored parasols that are hung throughout the trees. The opening reception is Friday June 20, 6 - 9 PM with an artist talk at 7:30 PM. The human figure has been the subject of art since the beginning of time. Every week, a live model is available for all Art League Houston members to freely sketch, draw, or paint. Participants will be able to observe the model and explore different techniques of approaching the human form on paper or canvas. A proctor will be present during the class. Sessions are $15 per session and meet weekly on Thursday and Saturday from 1:00 – 4:00pm, with all costs going directly back into the program. No pre-registration required – this is a drop-in program. Art League memberships start at $35! Click here to view the model schedule. Please join us at Art Junction's first party and fundraiser ART SHOW, a silent auction benefiting Art League Houston's (ALH) Public Art Esplanade Project at BlueOrange Gallery (1208 West Gray Street). The event features over fifty unique works of art, each measuring 5 x 7 inches by art students at nine Houston-area high schools, as well as a selection of well-respected local and national artists. Participating artists include Joe Havel, Jason Villegas, Gonzo 247, David Renner, Dean Ruck, Dan Havel, Phillip Pyle, Sarah Hamilton, David Hardaker, and Chuy Benitez. Admission is free. Invite your friends and family, and enjoy the opportunity to purchase amazing artwork at affordable prices! By participating, you will help Art Junction and ALH "humanize the built environment that we live in and invigorate the public spaces around us." Join us at this important junction of the art world, making Houston's artwork more accessible to all! Art Junction is a student-organized fundraiser event supporting public artwork and encouraging participation in the arts. They invite professional and high school artists to create one-of-a-kind pieces on 5 x 7 inches illustration board for a silent auction and sale, and 100% of the sales go directly towards a local public art project. Established in 2012-2013, The Esplanade Project is a community driven, temporary public art installation project designed to invigorate Houston's lower Montrose Boulevard and the surrounding neighborhood. This program is in partnership with the City of Houston and is a pilot project for the City of Houston. Participating artists receive an artist fee for the design, creation, and installation of their work as well as funding for materials and associated expenses. Special thanks to Texas Art Supply, and BLUEorange Gallery. Art League Houston is excited to present the 2014 ALH INSTRUCTOR/show, a group exhibition featuring over twenty works in jewelry-making, sculpture, mixed-media, ceramics, print-making and painting by some of Houston’s most exciting emerging and established artists who teach at the ALH School. Participating artists include Kelly Alison, Rebecca Bass, Ruben Coy, Caroline Graham, Steven Hook, Lisa Hunter, Jessica Kreutter, Polly Liu, Steve Parker, Phillip Pyle II, Preetika Rajgariah, Cary Reeder, Anat Ronan, Beth Secor, Myke Venable, Jason Villages and Melissa Walter. The opening reception is Friday May 2 from 6 - 9 PM. Art League Houston is excited to present the 2014 ALH STUDENT/show, a group exhibition featuring over fifty works in jewelry-making, sculpture, mixed-media, ceramics, print-making and painting by Art League Houston students who have taken classes during the Spring 2014, Winter 2013, Fall 2013 and Spring 2013 semesters. Please join ALH as we celebrate the talents and creativity of our students! Join Fresh Arts’ Executive Director Jenni Rebecca Stephenson and professional composer and musician, Jerry Ochoa of Two Star Symphony, for an overview workshop on strategies and resources for individual artists seeking funds to support their professional art career. This workshop will apply to all types of individual artists including those in the visual, performing, filmmaking, literary, and multi-disciplinary fields. In conjunction with the ArtBound! student exhibition in the Front Gallery of Art League Houston, students will read select work created during the in-school artist and writer residencies. Art League Houston is excited to invite the public to our annual fundraising event The MARTIKI: A Montrose Art Party (MARTY), on Friday, April 11, from 6 - 9 PM. The event benefits Art League Houston’s Healing Art Program, which provides free art instruction and supplies to adults living with serious illness and physical disabilities. Entry to the event is FREE! This year's party is tiki-themed - grass skirts and Hawaiian shirts are highly encouraged! The event will feature a selection of artwork for sale by Healing Art artists in the Main Gallery, as well as an exciting silent auction. A portion of the artwork and concession proceeds will help support the continuation of the Healing Art program. Classes are $15 per session and meet weekly on Thursday and Saturday from 1:00 – 4:00pm, with all costs going directly to the figure model and instructor. No pre-registration required – this is a drop-in program. Art League memberships start at $35! 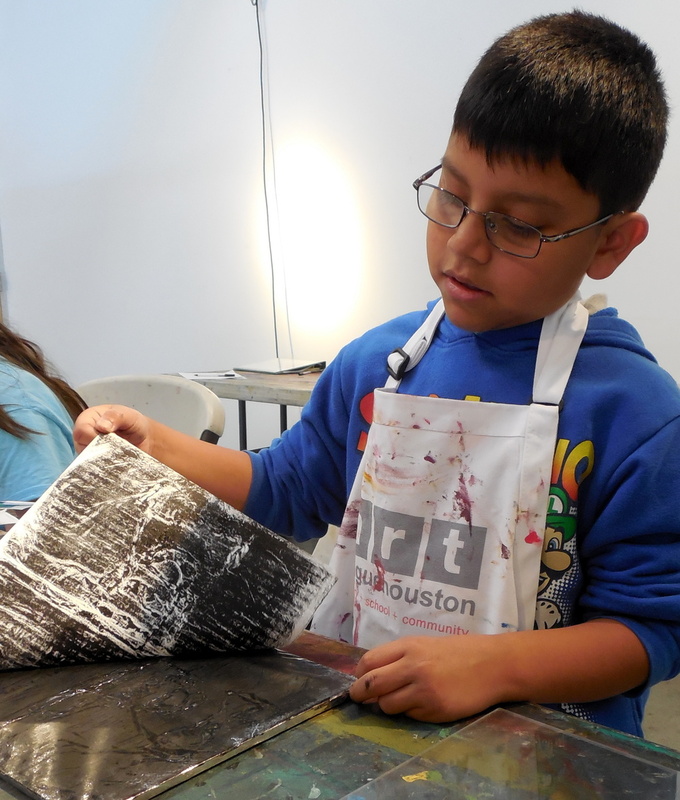 Register for a class during general registration by calling Art League Houston at 713-523-9530. To view the full catalog of classes, click here! Featuring a scavenger hunt, beading workshops, outdoor projection of South African music videos, South African-inspired cocktail, silent auction, and DJ Josh Zulu. A percentage of sales from select businesses goes towards support Art League Houston's upcoming project, 360 Degrees Vanishing, by Houston-based artist and designer, Selven Jarmon. Register early and save $25 per class! Call 713-523-9530 to register.